The Ratcliffe Hicks School of Agriculture confers Associate of Applied Science Degrees in Animal Science and Plant Science. This two-year program of technical and applied education is only available at the Storrs campus. The School was established in 1941 by the University of Connecticut through a bequest from Mr. Ratcliffe Hicks of Tolland, Connecticut. Students include recent high school graduates as well as adults who are interested in continuing education or a career change. Course work offers a balance between technical and theoretical aspects of each subject with emphasis on hands-on learning. Ratcliffe Hicks School of Agriculture graduates have the skills and knowledge to enter challenging and exciting careers. They are highly qualified for competitive positions and often manage or own businesses and production operations. Ratcliffe Hicks School of Agriculture graduates can also continue their education and pursue baccalaureate or higher degrees. Admission is open to qualified graduates of approved secondary schools. For required courses and units, please refer to the Admission section of this Catalog. Foreign language study is not required for admission into the two-year program; college preparatory level courses are recommended, but not required. Applicants follow the same process as other undergraduate programs at UConn. Applicants submit the Common Application or the UConn Admission Application, high school transcript, SAT or ACT scores, and personal essay, which is included in the application. Applicants are encouraged to emphasize their interest, experience, and career goals when completing the essay and activities sections of the application. Applicants with prior post-secondary course work must submit official college transcripts. Applicants who are not graduates of a secondary school must present a copy of a State Equivalency Diploma and a personal statement. Students from some New England states may be eligible to enroll in the Ratcliffe Hicks School of Agriculture at a reduced tuition rate through the New England Regional Student Program. Eligibility for Associate degree programs in Animal Science and in Plant Science are described in the Admissions section of this Catalog. Individuals interested in obtaining specific skills and knowledge relating to the many diverse areas of plant and animal science may also register for Ratcliffe Hicks courses as non-degree students. Non-degree students do not have to apply for formal admission to the University. The Ratcliffe Hicks School of Agriculture offers scholarships for qualified individuals entering the two-year program. Selected applicants receive up to $1,500 toward educational expenses in their first semester. Based on academic performance, scholarships may be renewed for three additional semesters. Incoming students are automatically reviewed for scholarships prior to entering the program. Selection is based on academic and career-related accomplishments, and potential for continued success. Many scholarships in Agriculture and Natural Resources are available to Ratcliffe Hicks students. For more information, visit the College of Agriculture, Health and Natural Resources website. The Ratcliffe Hicks School of Agriculture students major in Plant Science or Animal Science. 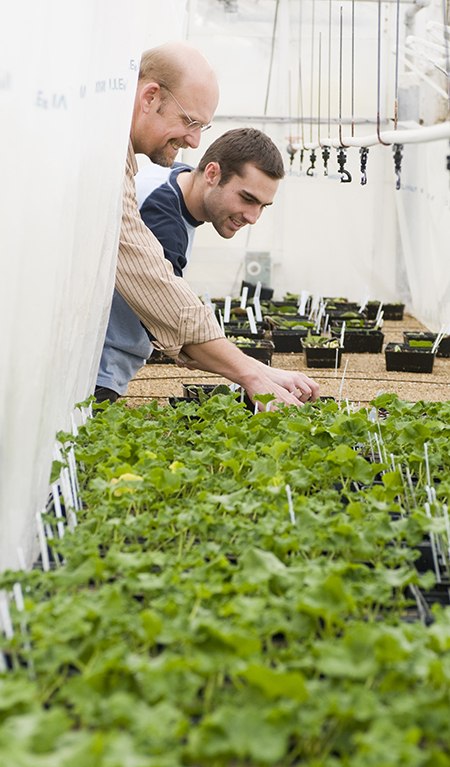 Plant Science majors may concentrate in ornamental horticulture, turfgrass management, or sustainable crop production. Graduates pursue careers in golf course management, sports turf management, floriculture, landscape and grounds maintenance, greenhouse and garden center operations, nursery management, interiorscaping, park and land management, public horticulture or various positions within the entire food crop production chain from field to fork. Animal science majors focus on equine studies or production agriculture, including both dairy and livestock. Graduates seek positions in the horse industry, production enterprises, animal health, breeding and genetics, nutrition, meat science and food handling, or related industries. Faculty advisors are assigned to students upon entry into the Ratcliffe Hicks School of Agriculture according to a student’s major and area of special interest. Advisors assist students in the selection of appropriate courses and help them develop an individualized program that will meet educational and career goals. The Ratcliffe Hicks Director’s Office and Academic Advisory Center provide additional support to faculty advisors and students. Ratcliffe Hicks students are restricted primarily to Ratcliffe Hicks courses, numbered 100-999. Ratcliffe Hicks students may register for up to 22 credits of 1000-level courses including NRE 1000, 1235; NUSC 1165; BIOL 1102 and the courses listed in the “Associate Degree Requirements” section below. No more than 22 credits of 1000-level course work may be used toward the Associate of Applied Science degree. Ratcliffe Hicks students must have approval of the advisor and Director to register for 1000-level courses not listed below. Ratcliffe Hicks students may not register for 2000-level or above courses or skill code courses (W, Q) unless approved by the Director. Inappropriate registration may result in administrative changes to a student’s schedule or credit restrictions toward graduation requirements. Ratcliffe Hicks School of Agriculture students who have earned at least 24 credits and are not on scholastic probation may place a course, for no more than four credits, on Pass/Fail. Credits earned from a Pass/Fail course may be used toward the total credit requirement for the Associate of Applied Science degree, but cannot be used to meet any other graduation requirement. Upon recommendation of the faculty, the degree of Associate of Applied Science is awarded by vote of the Board of Trustees to students who have met the following requirements: (1) earned a total of 64 degree credits; (2) earned at least a 2.0 grade point average for the total number of calculable credits for which they have registered; (3) passed all courses required by the faculty of the Ratcliffe Hicks School of Agriculture; and (4) earned at least 42 credits at the University of Connecticut in Ratcliffe Hicks courses numbered 100-999. Transfer students may be eligible for an exception with approval of the Director. All students must pass the following courses to earn the Associate of Applied Science Degree. No single course can be used to satisfy more than one requirement. General Education Requirements for Ratcliffe Hicks students differ from University General Education Requirements for baccalaureate students. Writing: ENGL 1004, 1010, or 1011 (based on SAT scores). Mathematics: MATH 1011Q or higher (based on SAT scores). Civic and Community Engagement: One course from the following: ARE 1110; HIST 1501, 1502; NRE 1235; PP 1001; POLS 1602; or URBN 1300. Arts and Humanities: In addition to the Civic and Community Engagement course, one course from the following: ART 1000; DRAM 1101, 1110; FREN 1161, 1162, 1169, 1171, 1177; GEOG/URBN 1200; GERM 1169, 1171; HIST 1201, 1501, 1502; ILCS 1158; MUSI 1001, 1002, 1003, 1004; NRE 1235; PHIL 1101, 1102, 1104; POLS 1002; SAAG 350; SPAN 1001, 1002; WGSS 1104; other 1000-level course approved by the Ratcliffe Hicks director. Social Science: In addition to the Civic and Community Engagement course, one course from the following: ANTH 1000, 1006; ARE 1110; COMM 1000; ECON 1000, 1201, or 1202; EVST 1000; GEOG 1000, 1700; HDFS 1060, 1070; POLS 1202, 1207, 1402, 1602; PP 1001; PUBH 1001; SARE 450; SLHS 1150; SOCI 1001, 1251, or 1501; WGSS 1105; or other 1000-level course approved by the Ratcliffe Hicks director. Other Alternatives: Students may substitute COMM 1100; NUSC 1167; SPSS 1125 for the Social Sciences requirement. Science and computer technology requirements for the A.A.S. degree are incorporated into courses required for the major. BIOL 1102; SAAS 101 111, 112, 113, 121; SAPB 301. All majors must pass SAPL 120, 300, and 840. Plant Science majors may select options in Ornamental Horticulture, Turfgrass Management, or Sustainable Crop Production. Ornamental Horticulture: SAPL 410, 550, 640, 810. Turfgrass Management: SAPL 110, 315, 800; three credits from SAPL 991. Sustainable Crop Production: SAPL 101, 500, 620, 810, 991. In addition to the general education requirements and the major core requirements listed above, students must complete at least 12 credits of course work related to an area of specialization within their major. These courses must be Ratcliffe Hicks courses numbered 100-999 and must be approved by the student’s advisor. Students may apply no more than six credits of these courses toward the minimum graduation requirement of 64 earned credits. Students should work closely with their advisors to select appropriate courses. Each student should prepare a tentative plan of study with an academic advisor as early as possible, outlining all courses.A final plan of study, approved by the major advisor and the Ratcliffe Hicks School of Agriculture Director, must be filed with the Director of the School and the Degree Auditor no later than the end of the semester prior to the semester of expected graduation. The Ratcliffe Hicks School of Agriculture follows the same academic regulations and procedures regarding scholastic standards and probation as all other schools and colleges of the University except: first semester Ratcliffe Hicks students are subject to dismissal from the University if their semester grade point average is less than 1.2. Ratcliffe Hicks courses (three credit courses in SAAG, SAAS, SANR, SAPL, SAPB, SARE) are subject to the policies of the Transfer Admissions Office, i.e. earned grade must be C or higher; credits transfer but grades do not; course equivalency is determined by departmental review. Baccalaureate courses (four-digit course numbers) and grades will be applied to baccalaureate program if the grade earned was C or higher, or if an exception is approved by the RHSA director. Courses graded satisfactory/unsatisfactory or pass/fail do not transfer. Many courses require off-campus field trips. Students should budget money for participation. For fees and expenses, see statement under Undergraduate Fees and Expenses.